‘First tragedy, then farce’: The scandalous imperialism of the Red Dawn remake | Fight Back! About 160 years ago, Karl Marx wrote that history repeats itself, “the first time as tragedy, the second time as farce.” And speaking to his statement in 2012, it’s hard to think of any modern example better than the remake of the 1984 film, Red Dawn. In the original Red Dawn, released in 1984, Patrick Swayze, Charlie Sheen and a host of other actors play high school students from Small Town, USA, who become guerrilla fighters after the Soviet Union, Cuba and Nicaragua’s Sandinistas invade the U.S. Calling themselves “Wolverines” after their school mascot, the rag-tag insurgent force uses guerrilla warfare tactics to acquire weapons and begin launching small-scale attacks on the occupying army. In 2012, with the Cold War more than 20 years in the past, MGM Studios has changed the enemy from the Soviet Union to the Democratic People’s Republic of Korea (DPRK). It’s not that Red Dawn is unique as a right wing, pro-war action flick. In 2011, Hollywood foisted Battle Los Angeles onto audiences, which was just a multi-million dollar military recruitment video with aliens. In February, Hollywood released Act of Valor, a rabidly pro-war film financed by the U.S. Navy that took propaganda to a new level by casting actual Navy SEALS in the lead roles. Even the original Reagan-era Red Dawn was released as a fairly unremarkable Cold War propaganda film, designed at scaring audiences into supporting war with the Soviet Union. And yet there’s something so much more sinister at work in the new remake of the 1984 film, Red Dawn. In this era of growing resistance to U.S. imperialism – an eleven-year U.S. occupation of Afghanistan, drone strikes from Pakistan to Yemen and the extra-judicial assassination of U.S. citizens suspected of being enemies – it’s downright bizarre and offensive to portray the U.S. as an occupied or oppressed country. Put simply, the only thing truly remarkable about Red Dawn is the sheer magnitude of its scandalous political distortions. Red Dawn begins with a fast-paced flurry of news clips, speeches by U.S. politicians and pundits and brooding imagery of the North Korean military marching in lockstep. Immediately the film’s Tea Party worldview is clumsily thrust onto the audience as reporters tell us that the U.S. and Western Europe have taken on too much debt and over-extended their military, leaving their borders supposedly unprotected. A barrage of voices begin fanatically screaming about the threat posed to the U.S. by North Korea, as if repeating it more loudly each time will make it true. At one point, the film even regurgitates the famed 2010 lie that the DPRK sank the South Korean ship, the Cheonan, in 2010. The Chinese and Russian Navy, along with the University of Manitoba, disproved this story in their own independent investigations. Indeed, the irony of the Cheonan incident’s inclusion in Red Dawn is lost on no one who read the Chinese report, which implicates a rising mine planted by the U.S. Navy in the sinking of the South Korean warship. I completely dismiss the notion that anyone should write off Red Dawn as “just a movie.” Equally ridiculous is the idea that everyone leaving the theater will clearly recognize that the whole premise of a North Korean invasion of the U.S. is total baloney. This is the film that director Dan Bradley ostensibly wants audiences to think is set in the real world, evidenced by the opening montage of news clips and political speeches about the supposedly looming threat of the DPRK. By using real events at the start of the film, even if they are strung together in a ham-handed manner, the director is deliberately telling the audience that this story is set in the real world. Let’s be clear about a few facts that completely flip Red Dawn on its head: It is the U.S. – not the DPRK – that forcibly partitioned Korea after the end of the World War II in 1945. It was the U.S. that fought a war of aggression against the Korean people, beginning in 1950, resulting in more than a million deaths. It was the U.S. that installed a puppet dictator in the occupied south of Korea, Syngman Rhee, who collaborated with imperialist powers to execute dissidents and activists. The U.S. is a foreign invader that currently occupies half of Korea, with 28,000 troops permanently stationed in the south. The DPRK has no missiles or rockets within striking distance of the continental U.S., but the U.S. perpetually has nuclear weapons pointed directly at the DPRK, itself a country slightly smaller than the state of Montana. 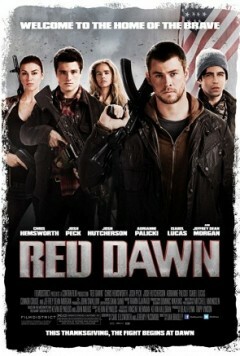 The only aspect of Red Dawn more absurd and offensive than its overall right-wing message was its production process. Originally, the film portrayed China, not North Korea, invading and occupying the U.S. Shortly before its release, MGM decided that antagonizing China in the story line would restrict their access to international audiences and result in the movie being less profitable. Revealing the inherent racism of the film’s producers, the studio spent about $1 million to make cosmetic changes, like inserting new flags and reworking small bits of dialogue, to recast North Korea as the occupying army. Red Dawn is an explicitly anti-Asian film, but one of the less talked about aspects of the film’s racism is its treatment of Black characters. Stoking Tea Party racism, the film portrays an African-American mayor as a cowardly collaborator with the occupying army. In an early scene, his call for the Wolverines to surrender is contrasted with the defiant attitude of the white police sergeant, whose subsequent death at the hands of the ruthless Captain Cho is portrayed as self-sacrificial and heroic. Beyond the disturbing right-wing messages, though, Red Dawn is a terrible film. The youth’s transition from high school jocks to guerrilla fighters takes place in a three-minute montage without exploring any of the everyday hardships of insurgency. The villains are just emotionless vessels rampaging relentlessly on-screen, further adding to the racist portrayal of Asians. None of the actors seem to get it right, with some over-acting (Josh Peck) and others giving wooden performances (Chris Hemsworth). And the story line is full of plot holes and inconsistencies, just as it was in the original film. As ludicrous as Red Dawn was in the 1980s, the remake is downright disturbing. Rest assured, the U.S. was as much of an imperialist power in 1984 as it is today, but with the presence of a nuclear-armed Soviet Union, whose influence extended to popular governments and liberation movements around the world, U.S. military aggression towards oppressed nations back then was checked. As tempting as it is to call for a boycott of Red Dawn, the film’s poor opening on Thanksgiving weekend – finishing in seventh place at the box office behind Twilight: Breaking Dawn Part 2 and Disney’s Wreck-It Ralph – combined with across-the-board panning by critics may have already achieved the goal. Progressive activists might catch the Red Dawn remake on a late-night cable channel, but the $10 ticket price is probably better spent on picket signs or paint for an anti-war rally. Nevertheless, activists and organizers must recognize that Red Dawn is pro-war, anti-communist propaganda designed to reach a mass audience and demonize a country that simply is not a threat to the American people. The Red Dawn remake may be an embarrassing and laughable farce of a film, but the imperialist agenda it serves is very real. Instead of seeing Red Dawn in theaters, activists ought to use the film’s release as a starting point to talk with people about the nature of imperialism and propaganda. With continued U.S. aggression in the Korean Peninsula, the time is now to continue strengthening resistance to war and occupation. And ironically, a film as appallingly bad as Red Dawn provides an opportunity to begin that process.